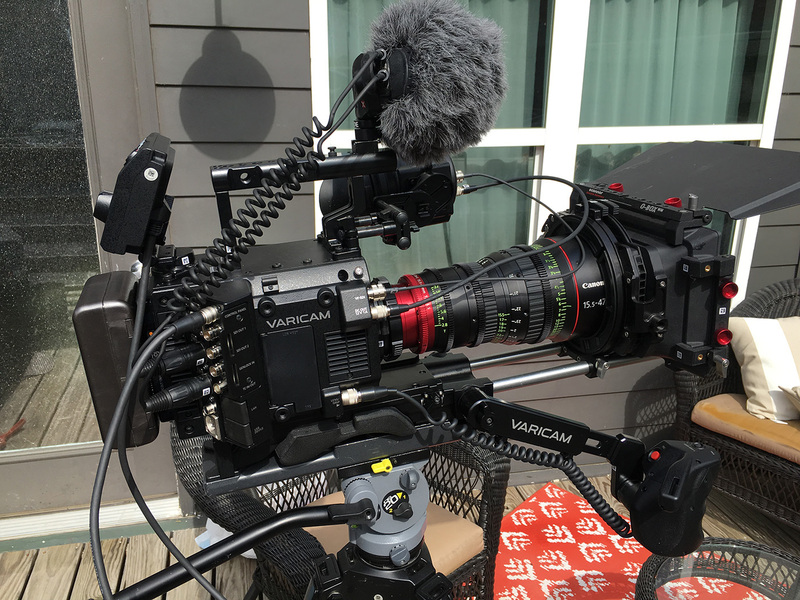 Panasonic’s new Varicam LT is basically a lighter-weight, more compact version of their Varicam 35, which has seen relatively wide adoption since its introduction in 2014. Weighing in at 6 pounds (body only) the Panasonic Varicam LT is a capable alternative for applications such as gimbal work or shoulder mounted operation, setups that can be difficult or impossible with the more cumbersome Panasonic Varicam 35. Don’t assume, though, that the lighter weight means lesser performance. With the exception of higher-end codec options that require the larger recording unit on the Varicam 35, the LT is poised to be every bit as powerful and popular as Panasonic’s flagship cinema camera. 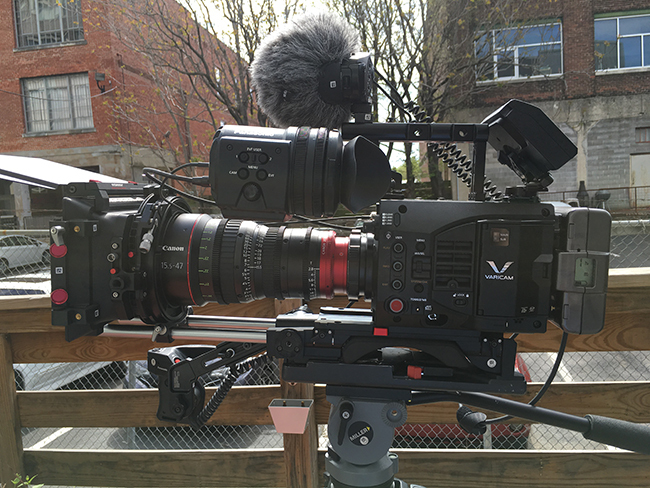 To really put it to the test, I shot with it for two days in downtown Memphis to see whether or not it lives up to the expectation that the Panasonic Varicam 35 has set. The first thing that impressed me in my time with the camera was the build quality. Firstly, other than the plastic cover for the Wi-Fi module port (presumably for signal strength), nearly the entire camera body is constructed of lightweight magnesium. It’s really important, especially with a camera like this one that’s meant to be used in a run and gun documentary setting, that you don’t run the risk of destroying your equipment if it gets bumped around a little. Plastic camera bodies like the Sony PXW-FS7 are affordable and light, but probably won’t fare too well after a fall. The Panasonic Varicam LT, on the other hand, feels like it could stand up well to rigorous use. All of the buttons on the camera body and control panel are LED backlit, which is a really nice touch that I’m hoping to see more manufacturers implement in the future. If you need to be stealthy or conserve battery power, though, the lights can be dimmed or switched off entirely. Finally, the EF mount features a locking ring, much like the one on a PL mount, which helps secure larger EF lenses. 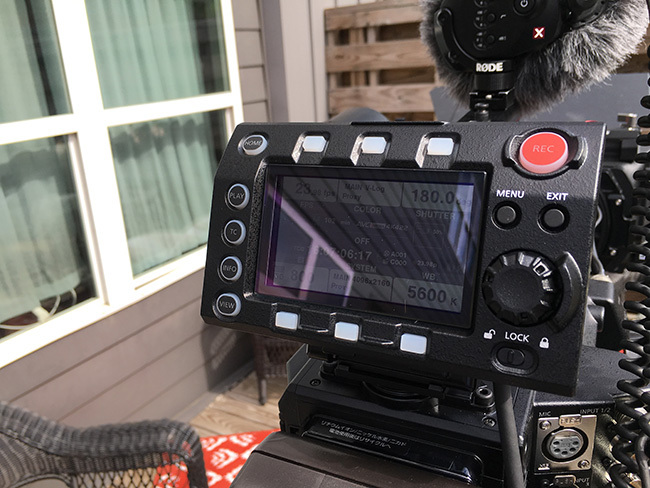 As a side note, the fact that this feature is missing from the Canon C300 Mark II is one of my only major gripes about that camera, especially since the EF mount on the older Canon C500 had one. 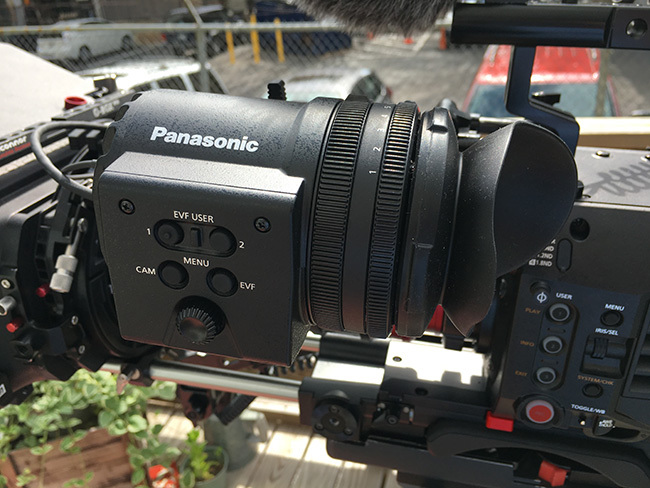 Both the EF and PL mount versions of the Panasonic Varicam LT will ship with a control panel that opens up a variety of setup options while still allowing for management of the camera’s settings and can even be used as a live view monitor in a pinch. The detachable control panel can be mounted just about anywhere and connects to the camera body with a 2-foot cable. For a traditional studio setup, for example, you’d mount the control panel on the right side of the camera, opposite the viewfinder, for use by a Camera Assistant. On a shoulder-mounted ENG-style shoot you might want it on the left, facing the operator. With the camera on a gimbal you could mount the control panel to the top cross bar or even dial in settings before removing it entirely. It’s a really great way to enable flexibility without sacrificing function, and I think it’ll be one of the standout features of this camera. Design-wise, it takes a lot of…I’ll say inspiration from Arri’s control panel from the Alexa and Amira lines, which is a theft I can’t really fault Panasonic for. If it works, why not take it? Ergonomically, with the shoulder pad, grip module, and viewfinder attached, the Panasonic Varicam LT is among the best cameras we carry for shoulder-mounted operation. The grip attaches via industry standard Arri rosettes and features two user-programmable buttons in addition to a record button and an iris control wheel. It actually looks, feels, and operates a lot like the Sony PXW-FS7 side handle except that it can be adjusted without tools, which I think is a huge plus. The shoulder pad is soft without being pillowy, and is adjustable relative to the camera body, which makes it easier to balance heavy lenses. In my setup, for example, you can see that I have the shoulder pad about as far forward as it would go in order to bring the center of gravity of my camera setup nearer to the center of my shoulder. During my two-day shoot, the camera remained remarkably balanced and comfortable even over a long period of time. In fact, I can only think of two negatives. First, the viewfinder bracket didn’t extend far enough from the camera body for my tastes. Even with the viewfinder as far out as it would go, I had to position the camera closer to my neck than the outside of my shoulder, which put the side of the camera body in contact with my right ear. It’s a minor inconvenience, but something that could easily get annoying over the course of a whole shooting day. Second, there aren’t any physical audio controls on the camera body. You have to jump into the menus on the control panel if you want to adjust your input levels. Sure you can map one of the user buttons to get you to the input level menu quickly, but I’d still prefer some physical dials. My guess is that Panasonic assumes that, with a camera in this price bracket, you’re going to be running dual-system sound, which I suppose is fair. I think, though, that if your camera has XLR inputs there should be physical volume controls whether you think they’ll be used or not. 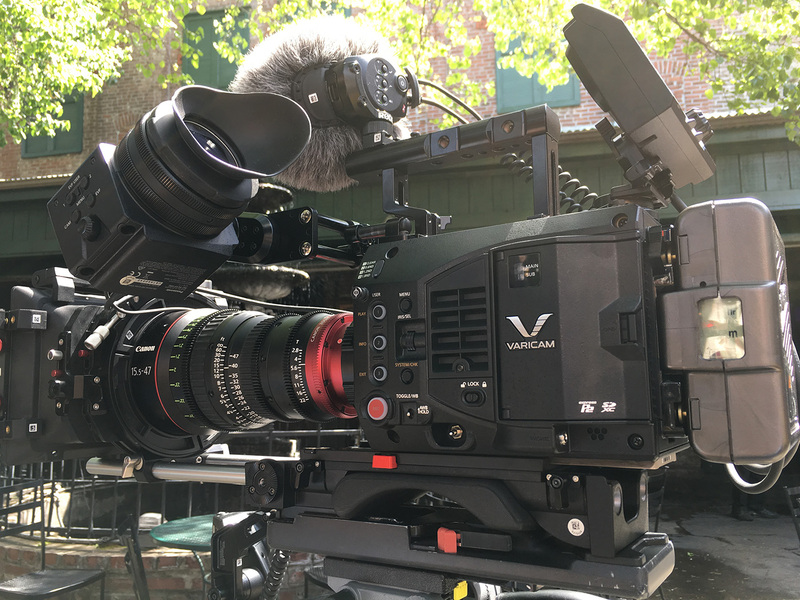 There’s a detailed list of features, codecs, and frame rates on the Panasonic Varicam LT product page, but I’ll give a quick rundown of the highlights here. Most importantly, the camera will shoot UHD (3840×2160) or DCI 4K (4096×2160) at up to 30p in a 10-bit 4:2:2 color space using the AVC-Intra 4K422 codec. Knock that down to AVC-Intra 4K-LT and you’ll be able to record UHD or DCI 4K at up to 60p. Beyond that frame rates vary based on codec, resolution, and sensor crop, but the camera maxes out at 240p in cropped 2K. 4K RAW output is said to be coming with a future firmware update. The Panasonic Varicam LT shares a sensor with its larger, cinema-focused cousin the Panasonic Varicam 35. This sensor offers 14 stops of dynamic range in V-Log, which, if you’re unfamiliar is Panasonic’s proprietary log gamma. If you’d like more information on this color space, or log spaces in general, I wrote a blog entry about the subject a couple months back. Another unique feature of the sensor is its ability to shoot at two different native ISOs, a feat accomplished by having two analog circuits for each photosite. In theory, this means that sensor noise and dynamic range should be equal at 800 and 5000 ISO. In practice, while I wasn’t able to do any strictly controlled scientific tests, I found that 5000 appeared a little noisier than 800, though certainly way less noisy than if I had pushed the ISO from 800 to 5000 on a camera with a native ISO of 800. Generally, I think people who need the second native ISO of 5000 for low-light shooting will be very happy with it. Overall I’d say that the Panasonic Varicam LT will turn out to be a really popular camera for high-end documentary work, episodic television production, or even low mid-budget indie cinema. My minor complaints (limited viewfinder adjustment and no physical volume controls) pale in comparison to the broadly positive experience I had shooting with this system. Below you’ll find a link to a quick edit of my shots from this weekend, including an ISO test. As always, if you have any questions or additions feel free to chime in in the comments. My name is Ryan and I am a video tech here at Lensrentals.com. In my free time, I mostly shoot documentary stuff, about food a lot of the time, as an excuse to go eat free food. If you need my qualifications, I have a B.A. in Cinema and Photography from Southern Illinois University in beautiful downtown Carbondale, Illinois. I’m guessing their assumption is that you’ll be using dual-system audio and any on-board sound will just be a scratch track. But the camera is clearly aimed at least partially at the documentary market, so I think they’re incorrect in that assumption. For this shoot I just set the levels to “Auto” and that worked well enough, but you’re right that it’s an annoying omission, especially on a camera that gets so many other things right. So glad you guys are carrying this. Just finished a shoot it would have been perfect for and I’m looking forward to getting my hands on one as soon as the right project comes in. The no volume dials thing is pretty annoying. Why leave that out?